Evolved Specification of the RS31 Puts You One Step Ahead - CipherLab Co., Ltd.
Taipei, Taiwan - 1 June, 2017 - CipherLab, a leading innovator in Automated Identification and Data Capture (AIDC), happily introduces the RS31 series as the new generation of mobile computers with enhanced features for the demanding retail, healthcare and field sales/services industries. The RS31 series' multi-touch panel offers a smooth touch-centric experience that supports sensitive touches from bare fingers to latex gloves. Maximum user-friendliness is provided by performing with Android 6.0 operating system which provides a similar personal smartphone operation experience. On top of the maximum user-friendliness, the RS31 series' reliable WiFi (IEEE 802.11 a/b/g/n) enables accurate data transmission and real time communication within the four walls. The RS31 series delivers fast-speed data communication anywhere through its 4G/LTE networks. Moreover, its removable battery allows workers to start the day with full power. The RS31's backup battery provides a 30 minute window for a replacement battery that further ensures collected data does not get lost. "The RS31 series is a refined and evolved mobile computer that gives users the next generation processing power today," Steven Liau, chairman of CipherLab said, "All of its highly efficient advantages are designed with a familiar user experience to ensure maximum productivity." 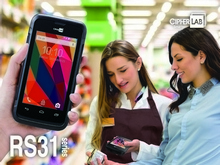 In addition to other consumer-grade smartphones, the RS31 series' data capturing options offers CCD, laser and 2D readers to efficiently capture 1D and 2D barcodes within four walls and under sunlight. It also has RFID reading capabilities and Near Far Communication (NFC) which enables peer to peer data communication. All of these sophisticated features are securely protected with CipherLab's rugged designs. Its IP67 rating, 1.2 m drop resistance and 150 tumbles at 0.5 m allows users to operate under heavy rain and dust without worrying about accidental falls.